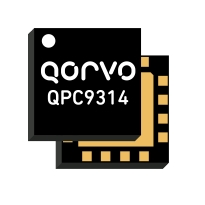 The QPC9314 from Qorvo is a front end module developed for TDD macro or picocell base stations. It consists of a high power switch and Low Noise Amplifier that operate from 2.3 to 2.7 GHz. This FEM integrates RF functional blocks such as a pin-diode based high power switch that can handle up to 52 Watts with an LTE signal (8 dB PAR) along with two LNA stages, and a 1-bit DSA to provide a high and low gain mode. This Switch/LNA module has a pin diode driver and dc-dc converter circuits integrated into the module and thus requires a single 5 V supply. The control voltage for the switch and gain control mode is with 3.3 V logic. The QPC9314 is available in a RoHS-compliant, 8x8 mm surface-mount leadless package. The switch LNA module is targeted for wireless infrastructure applications configured for TDD-based architectures.